I got a lot of hickory. A LOT of hickory. About 1100 board feet of it for a total cost of $0.43 per board foot including my mileage using the IRS rate for mileage. There are a lot of sup par quality boards but the good stuff I got out of it was well worth it. I’d consider the worst half of it to be paint grade. I started on hand tool tote #2. The last one was too small for my larger planes so I gave it away. I’m wanting to make a hand tool tote for the upcoming Oklahoma trip in June. If you are not familiar, it will be an outdoor woodworking event where we can all interact and possibly make something together. For more information visit videowoodworkers.com. The process for becoming a foster/adoptive parent is intense! My wife and I became foster parents last year. We truly enjoy it and love helping the children. I am excited for your family! Good luck! Wish I was in a position to come down to Oklahoma. an outdoor event sounds like a total blast. As far as you schedule of content goes, I think you are doing a magnificent job my friend. Projects take time to plan, prepare, execute, and finish. Adding to that the additional time to photograph/video the work, edit the video, review the video, re-edit, and finally post the content, and you have a MASSIVE PRODUCTION for a simple spice rack, bird house, etc. Remember that folks like Norm Abram had complete production crews helping them with every one of those tasks and still typically produced a mere 15 to 20 episodes a year (1 to 2 a month). So don’t get down on yourself. You have managed a far more demanding schedule virtually solo. Adoption is great. I was adopted, and could not have dreamed of a better childhood. I am proud of my parents and the home, family, and heritage they gave me. I have a great many friends who were also adopted and all of them feel the same way. We deeply love our parents, and could not conceive of having any others. The fact that your wife and you are choosing to have a family, and that you are working so hard to provide a warm and loving home, tells me that you will be great parents and that any child will be happy and proud to call you Mom & Dad. I will keep you both in my thoughts and prayers. I leave in Slidell, LA and you said that from your home about 2 hours south there is a place that you can get hard wood lumber. Would you mind telling me the name and location? In Slidell I can’t find any place that sells hard wood lumber. Thanks for your help, it would be great. Pickens Hardwood in the Jackson, MS area. Mate, you got to take off your hat while “trying” for baby! !… joking aside, stop panicking, relax and do what comes naturally….and it will ??? Wishing you both all the best from England ?? As they said in the 60’s….”Life is what shows up when you’re expecting something else”. 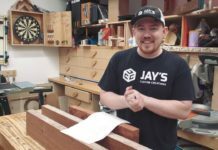 Family, home and woodworking….your priorities are in order! Best of luck with becoming parents. 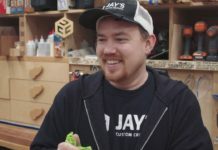 Thanks Jay! Congratulations – adoption is an awesome step to take. I wish you guys the best. And good call to put family first. As much as I enjoy seeing all your projects, you definitely don’t want to become a slave to just putting out content. Thanks for doing what you do! Congrats to you both on your decision to adopt. Here’s wishing you all success! By the way, ramble on my friend. Taking time to smell the roses is proof of being a thoughtful human and thoughtful humans make pretty great Dads. Congratulations to you and your wife. You will be giving a child a wonderful home and regardless of boy or girl. Either will be out in that shop saying “let me help Daddy”. I would like for you and your wife to take a look at our website and let me send you some of the emergency contact cards for wallets, diaper bags, etc. http://www.andycard.org again congratulations and thank you for all you provide us on your videos. Its great you put family first Jay. Its the right thing. I wish you both all the best know you are in our prayers. Congratulations to you and your wife on your decision to adopt. Don’t worry about the wood project content that will all take care of its self. Having the responsibility and love of a child is a life changing event you will never forget and trust me, having a family will be both of you and your wife’s greatest project ever. I will keep you both in my thoughts and prayers. Congratulations Jay, on both ventures. Congratulations to you Jay and your wife. Every child deserves a loving nurturing home environment, I’m sure both of you will do well. Enjoy being parents, it’s a very special gift.